The Metalcraft Practical Riveting, Bending & Rolling tool must be one of the most versatile hand powered diy metal working tools around today. With the special fitted rivet posts fitted, you can rivet metal pieces together with one of our 3mm steel rivets to provide a secure, strong and authentic looking joint that doesn’t need any heat or welding skills. In addition, it can be used as a metal bender to bend angles up to 90 degrees and it also comes with a special winding handle attachment to roll curves and circles which turns it into the perfect metal shaping tool for DIY metal working, commercial metal forming and school metalwork classes. These versatile 3 in 1 tools are the cornerstone of the Metalcraft range. They rivet your metalwork together without welding (see below) and they bend and roll your metalwork into shape. Rolling is achieved by using the winding handle to drive the bar forwards and backwards through the rollers. As this is done with each pass, the long lever is used to gradually increase pressure to roll an ever tighter curve. Updated in 2017 to now make it even easier to produce more consistent bends and circles/arcs when rolling. 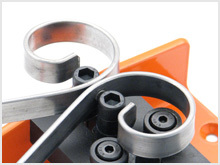 For the bending operation, material is placed between the square or diamond shaped former and the side rollers. Operate the lever to gradually bend to required angle. Riveting is simply achieved by placing the material to be joined (with rivet in pre-punched hole) between the riveting posts on the machine. Use the lever to squeeze up the rivet to form a strong joint. Metalcraft's riveting system provides a safe, strong and authentic way of joining metalwork together for beginner and professional alike. 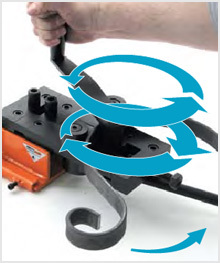 Naturally, those with welding equipment may prefer to use this as a quick and convenient way to join formed metalwork together particularly in commercial use. It is no surprise that those able to weld easily spot the business diversification opportunities that Metalcraft tools offer.